As rational adults who just happen to be dog owners, we all know that you should never leave your dog inside the car on a hot day. Right? 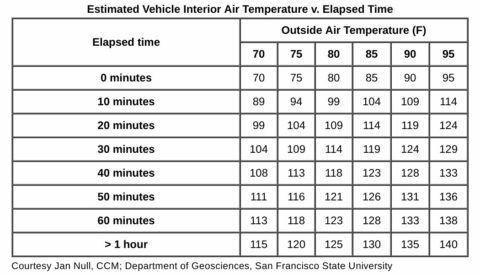 So, from one dog owner to another, please don’t leave your dog in the car on a warm day — even if the windows are rolled down. It’s animal abuse. 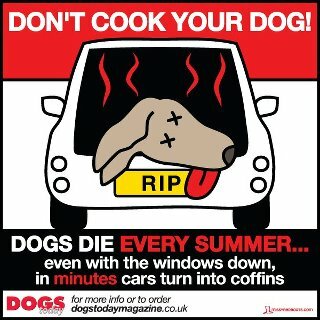 Leaving your dog in the car during the summer (even when it doesn’t seem all that hot to you) is similar to putting your dog inside of an oven! Seriously. The temperatures heat up so quickly that your dog becomes completely helpless when trapped inside the car on a hot day. Believe it or not, leaving the windows partially open is NOT enough. Parking in the shade WON’T keep the car cool enough either. Dogs feel heat differently than humans do. They sweat differently too. Dogs sweat by panting and by sweating from their paws. However, a dog trapped in a hot car cannot effectively rid its body of enough of the heat by panting and sweating — simply because there’s not enough cool, fresh air to replace the heated, stale air. Therefore, a dog breathing in warm/hot air for too long will suffer heatstroke …and could die. Just like kids trapped in a hot vehicle, dogs simply cannot withstand those high temperatures when confined in a small, enclosed space. While grocery shopping on a summer day when the temperatures were in the high 80’s, a woman pulled into the parking spot next to the one I was leaving. I noticed she had a full-grown German Shepherd in the back seat. The car windows were up, and the air conditioning was on inside her tiny 4-door vehicle as she pulled into the parking space. She looked embarrassed and said to me, “I know, but I’ve just got to run in and get some spray cleaner real quick.” She glanced around, as if to indicate that she had no other option, then she hurried into the store. I just stared in amazement. I certainly didn’t want to leave the dog alone like that! I should have offered to stay with her dog — with the windows rolled way down and me there to make sure he didn’t escape. Or, I could have walked him outside on a leash or something. But then there are all the trust issues that arise with someone whom you don’t know being in charge of your dog. Instead (and I admit I feel terribly guilty that I didn’t immediately choose one of the 2 options mentioned above), I parked my car nearby and watched and waited for the lady to return. My plan was to call 911 if the dog started to show signs of distress or if the dog’s owner took too long to return. Fortunately, she returned within about 6 minutes with the single item that she had purchased. (Those seemed like the longest 6 minutes of my life. Just imagine how it felt for the dog!) The lady definitely was in a hurry to get back to her car, where she quickly proceeded to roll down the windows and turn on the air conditioning to let the dog breathe in some fresh air. If nothing else, I hope that I was able to plant a seed in this lady’s mind that it’s not okay to leave your dog trapped in a hot car. Hopefully, she won’t want to be “embarrassed” like that again, so she’ll choose to leave her dog at home instead the next time. Still, I was left questioning my own actions. And feel terrible to this day that I allowed that dog to be left in a hot vehicle for even 6 minutes. It happens more often than you probably realize. Need proof? Just read all of these comments! The reason I’m writing this post today is to possibly help someone else who might find themselves in the same situation that I was in — as a witness to a dog left in a hot car. You don’t want to make a scene (though the dog’s life is certainly worth it). You don’t want to get the person in serious trouble (just a little trouble… enough that they’ll learn a lesson and never do it again). Here’s what you should do if you see a dog in a hot car, plus even more advice from the Humane Society of the United States. PETA, the largest animal rights organization in the world, has a supply of leaflets reminding drivers to leave their dogs at home when it’s hot outside. My Dog Is Cool, an organization devoted to helping people save dogs from dying in hot cars, has a number of different signs, posters, and fliers. Animal Legal Defense Fund, which fights to protect the lives of animals, has a car windshield sunshade that reminds everyone parked around you to do the right thing if they see a dog in a hot car. 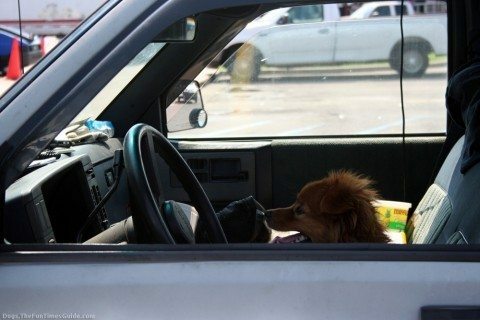 To be honest, it’s a little difficult to find out whether it’s technically illegal or not to leave a dog in alone in a vehicle in different states. Not to mention the fact that the laws in your city could actually conflict with the state laws regarding dogs. So, which laws should you follow? Obviously, I realize that there’s no way that a dog being left in a hot car would ever be viewed as the right thing to do. But still… it would be nice if animal cruelty laws were clearer and more readily available to everyday citizens. Not only would this benefit current dog owners (and future ones), it would also aid those who happen to witness a dog being left in a hot vehicle. I think people would be more inclined to speak up if they knew they had the law on their side. 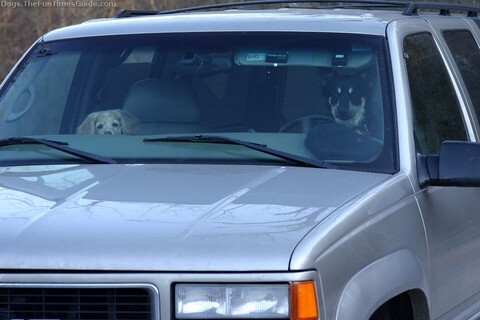 UPDATE: Where I live in Tennessee, a law was recently passed to protect dogs left in hot cars. In 2014, the “Good Samaritan Law” took effect, allowing people to break into a car if they see a child trapped inside a hot car. Starting July 1, 2015, that law also includes animals. What About A Dog In The Car With The Air Conditioning Running? Here’s more proof that dogs die in hot cars — even with temperatures in the 70s! UPDATE: You never know when you might have to break into your own car… like Carrie Underwood did when her dog locked the car doors on a hot day with her baby inside!